In episode three, join the cast as they discuss some issues surrounding Halloween and climate change denial. Also, this episode introduces two new segments to the show’s format. 1. During the episode Alaine wondered what percentage of people currently alive have Genghis Khan’s DNA. According to this study cited on National Geographic Online (http://news.nationalgeographic.com/news/2003/02/0214_030214_genghis.html) the great Khan has at least 16 million living descendants based on this study. 2. During the “Big Question” segment, Rick cited the World Wide Fund for Nature’s Blue Report on the extinction situation confronting marine wildlife. He observed marine populations had declined by 50%; however, the study establishes this decline is only 49% from 1970 to 2012. Rick also oversimplified the situation confronting sea cucumbers; that being, he generalized saying 98% of sea cucumbers were gone (implying a global problem). In reality, this figure only applies to sea cucumbers in the Galapagos region. He also made an error when he said upwards of 50-70% of ocean life depended upon the coral reefs; this figure is actually much lower (in the 25% range). Please see http://www.wwf.org.uk/about_wwf/press_centre/?unewsid=7673. 3). We depend upon plankton for 70% of our oxygen; a question was posed during the program about how a changing ph balance might impact plankton. The following article covers the topic in technical detail (http://onlinelibrary.wiley.com/doi/10.1111/gcb.12582/full). This article establishes a clear relationship between increasing ph and die off of corepods (plankton). The Wiley Online Library publishes articles in concert with various international and scholarly societies. The WOL is connected to a publishing company called John Wiley & Sons. While looking for studies relevant to ocean acidification and plankton, Rick came across this webpage http://www.nipccreport.org/articles/2012/aug/28aug2012a3.html. The page belongs to the so-called Non-Governmental Panel on Climate Change (NIPCC). The NIPCC site presents claims inconsistent with the predictions made by models reflecting the scientific consensus, i.e. the scientific consensus (as reflected in the Wiley article above) establishes a demonstrated and negative impact of increased ocean ph on plankton based on predicted levels of CO2 later in the 21st century. The NIPCC “study,” however, claims there’s no discernible impact on plankton if you increase ocean ph by the predicted levels. Curious to a fault, Rick decided to find out who the NIPCC was exactly; it turns out the NIPCC is an arm of the Heartland Institute (HI). The HI is not a scientific institution but a conservative public policy think tank funded by energy companies like ExxonMobil in order to deny climate change. The HI has also worked for Philip Morris (and the tobacco industry) to lobby governments to not ban smoking and to deny that secondhand smoke is harmful. The Heartland Institute’s purpose is to confuse the public with respect to science for the express purpose of enabling corporations to maintain the status-quo, i.e. new regulatory regimes or laws potentially increase the cost of doing business (and this is the ultimate evil to a corporation and its stake-holders); therefore, corporations use organizations like Heartland as instruments of propaganda. 4). Rick observed a significant “die off” of jelly fish due to changes in temperature near Fiji. In reality the die off took place in waters around rocky islands which form part of Palau. Fiji and Palau are separated by 5,500 kms. Here’s a link to an article describing the 1998 die off of jellies near Palau (https://en.wikipedia.org/wiki/Jellyfish_Lake). 5. In the show it was observed Fred Singer worked on the Manhattan Project. This was incorrect. Scientist Fred Seitz, also a climate change denier, worked on the MP. Fred Singer actually worked with the American navy during World War II. After being discharged from the navy he began working on rockets after the war. Both Seitz and Singer were science deniers and both received money and funding from corporations to challenge the scientific consensus on the risks associated with tobacco, climate change, etc. For more please see Naomi Oreste’s book Merchants of Doubt or Kerryn Higss Collision Course: Endless Growth on a Finite Planet. 6. 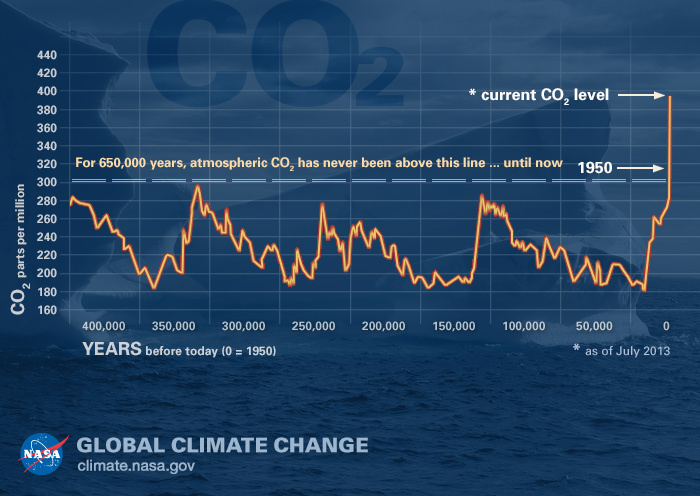 In the show, Rick mentioned we surpassed the 400 ppm CO2 in 2014. This benchmark was surpassed in 2013. The graphic to the left shows the dramatic increase in CO2 levels with the advent of the coal fueled Industrial Revolution (beginning in England in the late 1700s). For some additional context please visit the NASA sanctioned web site: http://climate.nasa.gov/climate_resources/24/. 7. During the cultural appropriation segment, Jess mentioned that the cast was white and therefore couldn’t understand what it’s like to not be a part of the dominant culture or to see themselves misrepresented in a mocking way. Lea would like to clarify that she self-identifies as Metis, but due to family circumstances she grew up experiencing white privilege and fully acknowledges the advantages she’s had. However she would like to note that it does hurt her to see a culture that is her heritage misrepresented and appropriated.